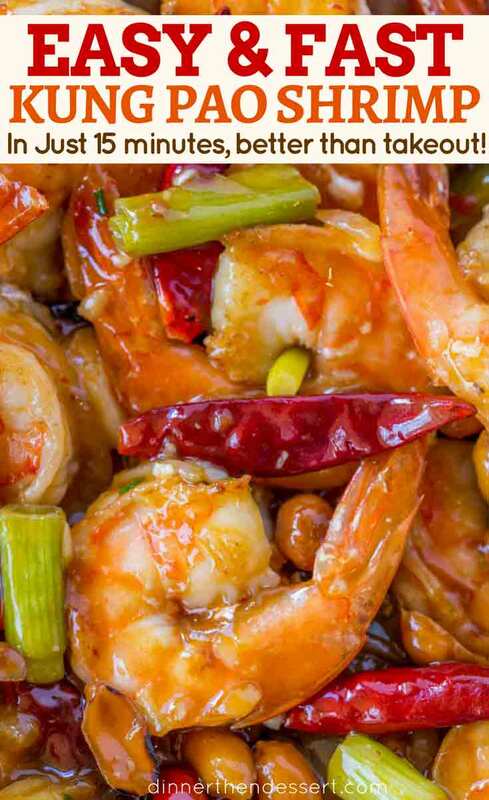 Kung Pao Shrimp is a Chinese food restaurant classic spicy garlic stir fry that’s healthy, easy and ready in less than 15 minutes! Just like my Panda Express Kung Pao Chicken and Kung Pao Chicken Spaghetti you’ll love this classic Chinese food favorite. Kung Pao recipes have always been a go to for me when picking out entrees. You start with Orange Chicken and Mongolian Beef because they’re fan favorites, add in Lo Mein and you’re left looking for a shrimp dish. 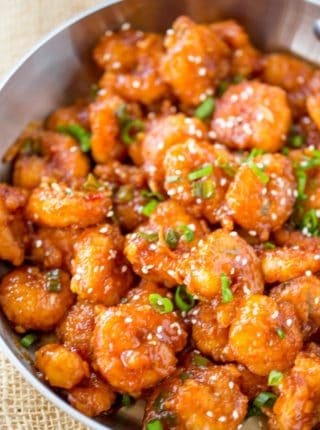 One of my favorites as a kid was the super vague “Spicy Garlic Shrimp” from Panda Inn. Yes, Panda Inn as in the original restaurant before the whole Panda Express empire even existed. 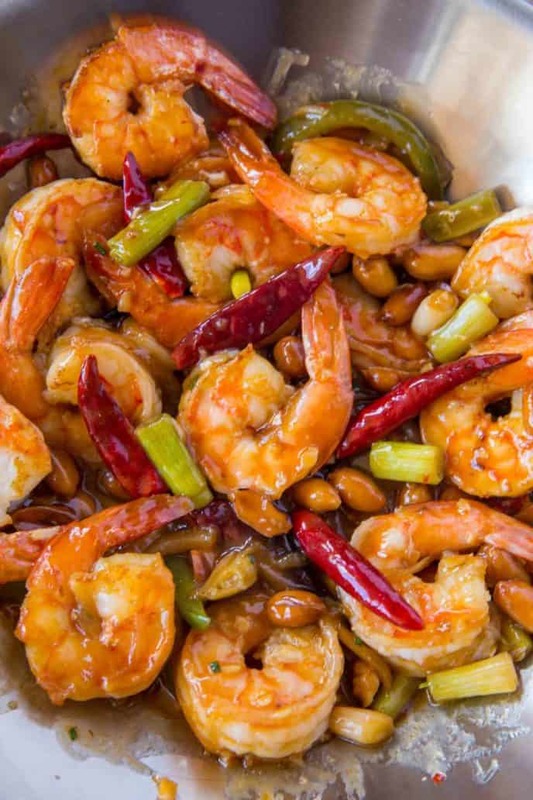 This Kung Pao Shrimp is my nod to that favorite dish I used to enjoy as a kid. The use of the entire chili pepper is meant to add heat to the dish without overpowering it. As the dish cooks it gets a small punch of heat from the exterior of the pepper cooking in the sauce but it doesn’t overwhelm the dish. Please don’t eat these peppers. 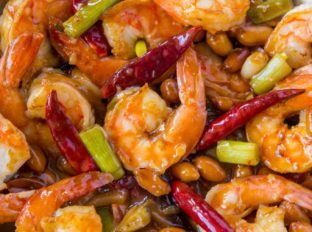 Is Kung Pao Shrimp Healthy? YES, the only things to rein in is how much oil you’re using in the wok. Keeping the oil to a minimum you can enjoy this dish as much as you’d like. There isn’t too much sugar or carbs in the dish. Have all your ingredients prepared before heating up the wok. As the oil heats up in the pan you’re going to be adding in the garlic and ginger along with the soy sauce and other ingredients in rapid succession. Because shrimp cooks very quickly do not do any prep work while cooking. The entire dish is done cooking in less than 5 minutes. Serve it over your favorite steamed vegetables or even cauliflower rice. 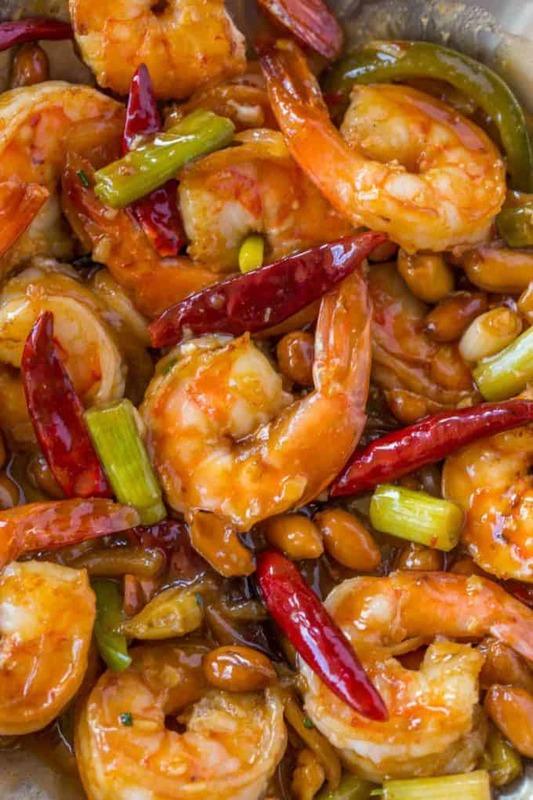 Kung Pao Shrimp is a Chinese food restaurant classic spicy garlic stir fry that's healthy, easy and ready in less than 15 minutes! Add the shrimp and cook 1-2 minutes on each side, or until cooked through. 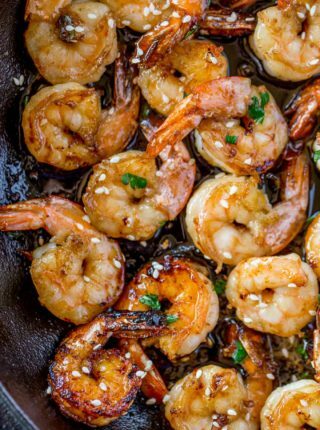 Remove the shrimp from the pan. Remove from the pan and add in the sesame oil, garlic, ginger, red chili peppers and green bell peppers and cook for 30 seconds, stirring frequently. Add in the cooking wine, soy sauce and cornstarch slurry. Cook for 1 minute, stirring frequently until slightly thickened. Add in the peanuts and green onions and stir. Add in the shrimp and stir together before serving. I made kong poa shrimp tonight. There wasn’t much liquid in the pan after it all. The meal was just fair. It probably would have tasted better over rice. 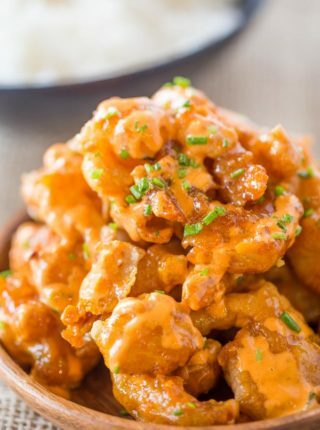 How much ginger do you add to this dish? So sorry about that…not sure how that got deleted. The recipe uses 2 teaspoons. Thanks! I will probably try making this dish this week or next! Lovely, but needs some seious sweetness such as dark brown sugar. Asparagus chunks work well with this to!!! Enjoy the recipes!!! This looks mouthwatering delicious. Can hardly wait to make it. Thank you! I’d love to know what you think after trying! Yes! So great for those busy weeknights for sure! I love a good shrimp dish! This one I have to make! Such a great recipe! Definitely must try this! 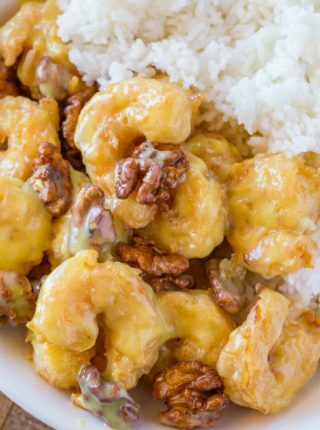 My family will love this shrimp! So flavorful! This looks better than anything I can get from a local restaurant. Aw, thank you! I hope you enjoy it!! YA KILLIN’ ME HERE! I bought all the ingredients for the Kung Pao Chicken to make tomorrow and now this???? 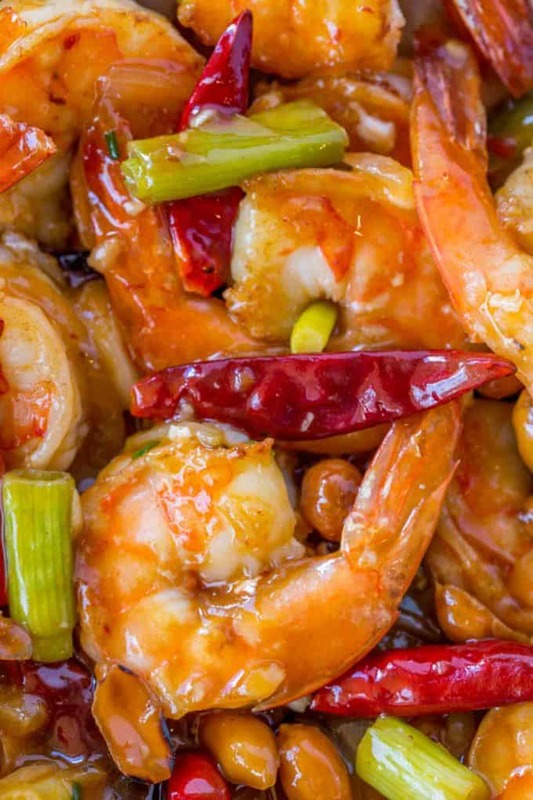 We absolutely LOVE Kung Pao Shrimp. 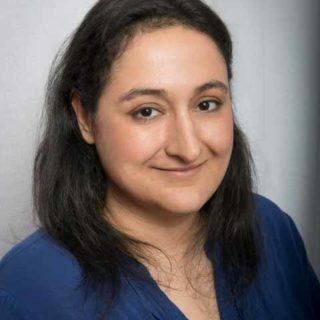 You have so many great recipes on your site, I don’t know where to start. I left a review on your Panda Express copycat chow mein, which I have made twice already, even though I’m not much on repeating meals, that’s how awesome it was. Haha, sounds like I’m giving you the RIGHT kind of problems!! I’m so happy to see that you’re enjoying all the recipes. I love Kung Pao chicken and where do you find these chili peppers you need or shrimp Kung Pao.